This is the official discussion topic of the OVERKILL's The Walking Dead Trainer and Cheats in the WeMod app. Please post any suggestions, bug reports, or praise that you may have for the cheats in here! Set your lobby to Private from map menu before using any of the mods. Nice stingerr was thinking about getting the game now i will. Thanks ! Wow the spammer. Guess it aint workin. Give stingerr a couple minutes to respond. But after reading your comments I thought you would understand that better ! some people may think that was spam and if whoever thought it was sorry but u haven’t seen spam unless u pissed me off and that type of spam isn’t just typing a sentence or paragraph. STINGERR-keep up the good work thanks a lot for the hitman mods. 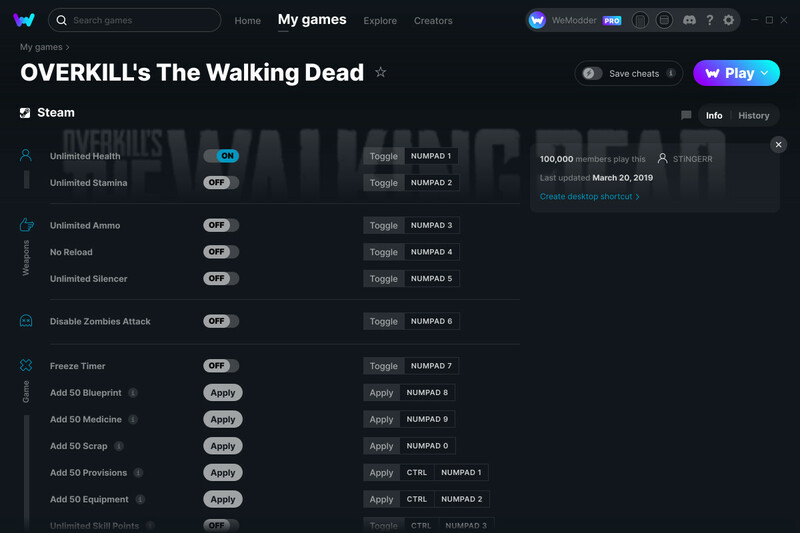 The OVERKILL’s The Walking Dead cheats have been updated!